Weekend greetings to you from Rhonda! Today's post brings you my project for our Quick Quotes CHA Sneak feature for the all new "One Fine Day" collection. The Design Team was graciously sent a Grand Calibur machine by Spellbinders and some fabulous dies to play with! Pair that up with our CHA Sneaks and well, you just have a whole lot of fun and creativity happening!!! Confession time... I have *ahem*, well, cough... a bit of a collection of Spellbinders dies. They are sort of like potato chips, you can't have just one! You'll see a variety of them on my project from sprockets, to circles both small and grand as well as a butterfly and a border. 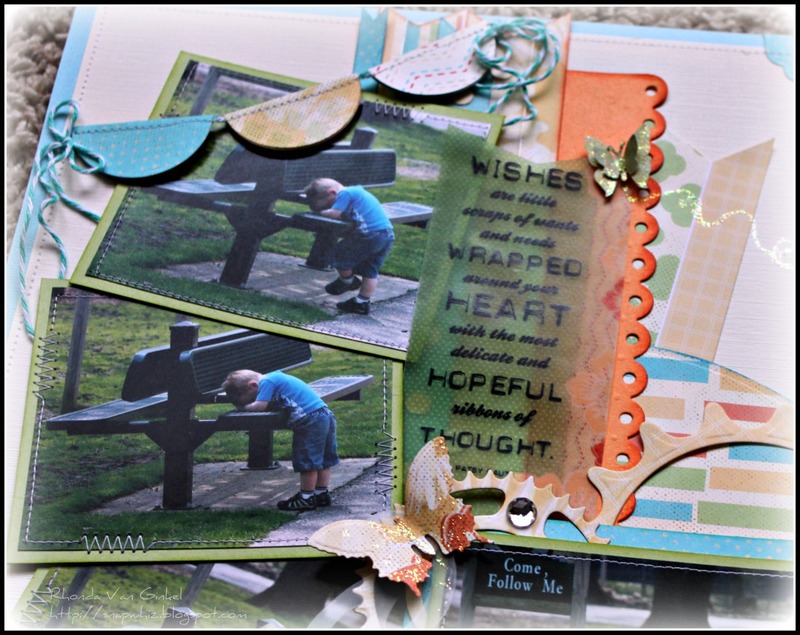 For the orange cardstock border, I used the Borderabilities die and ran it through two times. The Sprightly Sprockets dies were used here to continue the circle theme but with a bit more variety. 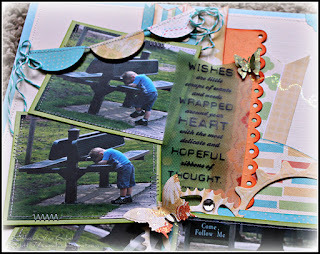 This paper collection has really great strips, I used them to create the vertical ribbon strip cluster. I used the Standard Circles Sm dies and folded them in half to create my petite circle banner. Acetate Mat, Que Sera Fera, K and Co. Thanks so much for stopping by today and spending a moment with us here at the Quick Quotes blog! a collection of "One Fine Day" for yourself! It's time for one more "win it before you can buy it" giveaway*! How about telling us what type of projects you'd like to see from the new Design Team? 1. Be a follower on this blog! 2. Leave a comment today! Come back and comment each day through 1/30 midnight pst! I love the pennant type banner. Those seem to be a trend right now. Beautiful layout, I love the gears that you put on the page. Thanks for a chance to win. Like the layout for how the photos tell a story with the arrangement. Like the butteflies embellishing. One Fine Day is awesome! How about an altered art project? I hope to win this before I buy it :)Love it! It's another fine day. and another fine project by you. What a fun layout! Love the gears and banner! What a fine project. Love the colors. Very pretty LO. I love spellbinders. I just got my first set about 3 weeks ago. TFS! Great layouts. 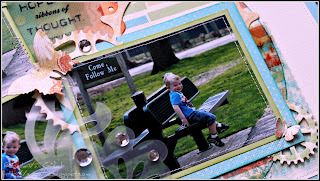 Love the use of spellbinders. Would love to see the use of lots of pictures in a 2 pg layout. Thanks for the chance tO win and have our own "One FIne Day"
Love the colors. That sprocket die is a must have. Amazing layout. Thanks for sharing. very cool lo. anxiously awaiting all the new goodies coming from cha. That layout is fabulous! I love the way you laid out the pictures...so very nice. Cute layout! Love the banner! Nice project and nice paper. Lovely layout, Rhonda! I love the colors. Great layout Rhonda and enjoy anaheim!!! wink, wink! I would love to se some cards with each line. This is a beautiful line and I love the name of it! Beautiful LO too! I would love to keep seeing more LO's, because those are what I need to work on the most! Thanks! Love the colors in this lo and all the details. I'd love to see some 2 page los. Love this layout. Love that you got so many photos on it. Wouold love to win the One Fine Day collection. Thanks for the chance. Love how you "piled on the pics" !